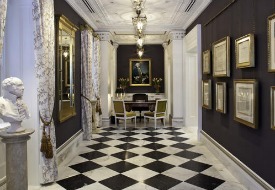 Staying at The Jefferson Hotel in Washington, D.C. I must admit that I have not visited our nation’s capital in some years, so I was pretty unfamiliar with the D.C. hotel landscape. 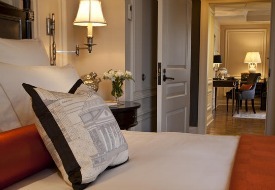 Fortunately, I found my way to an absolutely charming boutique luxury property, the Jefferson Hotel, which seems like a home away from home (if your home is a modest mansion) in many ways. It’s small enough to feel intimate and cozy, but large enough (99 rooms and suites) to have excellent hotel amenities, including a first-rate restaurant, spa, and gym. It also happens to be ideally located just a couple blocks away from the Smithsonian museums, the Washington Monument, and the White House. My perfectly appointed room boasted fine bed linens and towels, and though a bit on the "cozy" side, there was room for a plush chair. The hotel does have larger rooms and suites, with large marble entry foyers leading to gracious salons, but the smaller, more affordable rooms are just as adequate. Across the board, the service is exceptional, befitting the cabinet members, former presidents, and various celebrities who’ve all stayed here. Off the lobby and first floor, the Quill Bar seems like the quintessential kind of "back room bar" that Washington insiders use when making political deals. It has the perfect ambiance for negotiation. Meanwhile, the very intimate Book Room, also just off the lobby, is a serene hideaway for reading or to imbibe in discreet drinks with a friend. With fine artwork gracing every room of the hotel, both public and private, it’s apparent that the Jefferson’s owners, the Millstein family, have exquisite taste. I found myself wandering the public spaces just marveling at the art, much of it handpicked from across Europe. My one regret is not having stayed longer at the Jefferson, but now I have a great reason to return. Hotel prices range depending on room type (check online for current specials). See our Washington, D.C. destination guide for more trip-planning information, then use our Travel Search price comparison tool to find the lowest rates on flights.